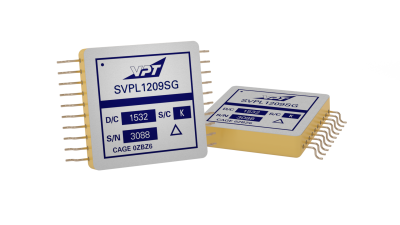 SVPL1209SG Point of Load DC-DC Converter | VPT, Inc. The SVPL Series of space qualified point-of-load DC-DC converters is specifically designed for the harsh radiation environment of space applications. Performance is guaranteed through the use of hardened semiconductor components and analysis. The SVPL Series has been characterized for Total Ionizing Dose (TID) performance including Enhanced Low Dose Rate Sensitivity (ELDRS) and for Single Event Effects (SEE) per VPT’s DLA-approved Radiation Hardness Assurance (RHA) plan per MIL-PRF-38534, Appendix G, Level R.
The SVPL1209SG is based on the Intersil ISL70003ASEH radiation-hardened monolithic buck regulator. It is designed to operate from a nominal 3.3 V to 12 V bus. The SVPL1209SG supplies low voltages at 9 A with high efficiency and fast transient response, making it an ideal choice to supply point-of-load applications such as high performance space processors. To provide you with the most accurate data for the actual performance of this product once deployed, please note that the electrical performance data provided below is at Tcase = -55°C to 125°C, Vin= +5V ± 1%, Vout = 3.3V ± 1%, full load, unless otherwise specified.